Q. Where does this camp take place? A. The camp takes place on the grounds of Farmamerica at 7367 360th Ave. Waseca, MN 56093. Campers and parents should report to the main entrance of the visitor center. Q. How much is the week-long day camp? A. $250 is the non-member rate. $225 is the rate with a Farmamerica family membership. If a sibling signs up for a 2019 Farmamerica summer camp, the rate drops down to $200 for the sibling. This fee includes five days of programming, supplies, a daily snack, and a t-shirt. In the event of a medical condition that causes cancellation, a full refund will be given if we cannot move the child into another week of camp. Written notification from the family and physician are required. There are no refunds or pro-rated fees if your child leaves camp early or arrives late due to an accident, illness, homesickness, behavior problems, other activities to attend, or camper or parent/guardian request. A. Farmamerica offers before and after care during the summer program. The care times are between 7:30am -9:00 am & 3pm-5pm. If you pick your child up after 3pm, you will be assessed the $20 fee for before and after care. If you are running late, immediately contact the Programming Director at 651-470-3581. Children must be picked up by the end of program time, 5:00pm. Late fees will be charged for pick up after this time. A $10.00 fee will be assessed for the first 1 to 15 minutes late, after 15 minutes, an additional $1.00 per minute will be assessed. Failure to pay any additional fees may result in termination of care. If a child is not picked up within 15 minutes after scheduled closing time, Farmamerica site staff will call Parents/Guardians and emergency contacts. If no one can be reached within 30 minutes after program end time, Farmamerica staff reserves the right to contact the Police Department and/or Child Protective Services to take the child until the Parent/Guardian is located. A consistent pattern of late pick-ups may be grounds for dismissal from program. Q. Does Farmamerica provide lunch? A. No. We find that kids prefer to bring a lunch from home. There will however be a healthy snack provided each day and we encourage campers to bring a reusable water bottle that can be refilled throughout the day. Lunches will be refrigerated after drop-off. Q. What happens if there is severe weather? A. Safety is our priority at Farmamerica. We keep our schedule flexible and arrange activities to fit the weather forecast. That being said, it’s Minnesota and weather can be unpredictable. If the Farmamerica area is placed on a weather alert, all campers will be brought into the Visitor Center and weather protocol will be followed. Extremes in weather will be evaluated by the Farmamerica staff if the center will close all anticipated participants will be contacted, and we will post on social media. Q. What happens if there is an accident or emergency? A. In the event of an accident, first aid will be administered and an incident report will be completed by Farmamerica staff. Parent/Guardians will be notified as soon as possible after managing the child’s immediate needs. In case of an emergency, the program will call 911 and contact the Parent/Guardian or emergency contacts provided with the youth’s registration. Staff are trained in emergency responsiveness and procedures are posted on site. Q. Will Farmamerica staff handle my child’s medications? A. Before the dispersal of medication at Farmamerica the Parent/Guardian must complete and sign a medication dispense form – this form can be found Here or in-person on the first day of camp. Q. What if my child has allergies and/or asthma? A. The farm and outdoor environment of Farmamerica can aggravate allergies. Any camper with known allergies that could lead to severe allergic reactions must bring an appropriate treatment kit to camp. Asthma: Any camper with asthma must bring medication for treatment. Even if the camper has not needed this medication recently, camp activities/locations, heat, and dust can aggravate symptoms. Food allergies or any dietary needs must be indicated during the registration process. Q. What should my child wear and bring with them? What should they leave at home? A. Campers should prepare for the weather, including rain gear, long-sleeved shirts, and long pants. A hat is highly recommended daily and closed-toed shoes are mandatory. For horse camp, long pants should be worn daily. Boots are encouraged but not mandatory. Large electronics should be left at home. If your camper carries a phone, they are responsible for it. Farmamerica is a big place and we will be covering large areas daily, camp time will not be spent looking for lost phones. 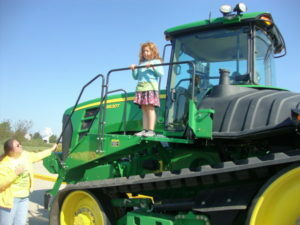 Farmamerica staff will be connected with the main office and parents can call that number (507-835-2052) during the day to get messages to their campers. Q. How does Wraparound Care work? A. Farmamerica staff will provide before camp care starting at 7:30am, and after camp care until 5pm. During wraparound care, campers could be doing anything from an early morning dance party, special art or science projects, role-playing, reading, farm chores, etc. Q. How does pick up and drop off work? Can I send someone to pick my camper up? Use the main entrance, park your vehicle and proceed to the visitor center to meet the Farmamerica staff. Notify Farmamerica regarding any change to your account or child records, including email, authorized people, allergies, etc. Children will only be released to parents/guardians or those authorized by the parent/guardian in advance and in writing. The Farmamerica staff will ask to see a valid picture ID to identify authorized person/s. If the Farmamerica staff member does not recognize the parent/guardian, they may ask to see a photo ID. This is for the protection and safety of your child. Q. What are the t-shirt sizes? A. Youth Small – Extra Large, Adult Small – 2XL. They are made of preshrunk cotton. Q. What will my camper be doing during the day? A. Below is an example schedule. 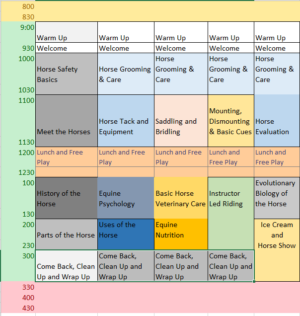 The schedule is tentative and can be adjusted without prior notice.